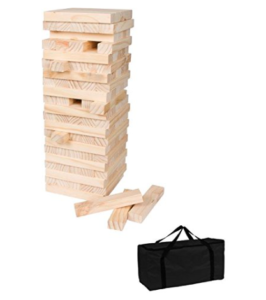 This giant Jenga pine puzzle game contains 56 pieces that each measure 8.2″ L x 2.75″ W x 1.73″ H. Build your tower to almost 3 ft. tall then take turns carefully removing pieces and stacking them on top. Whoever makes the tower tumble loses the game. Comes with a convenient carry case. Use caution and stand when stacking pieces. Make certain there are no small children near when stacking pieces. Always provide adult supervision when playing this game. By Trademark Innovations.56 pine puzzle pieces. I have changed my rating from 3 to 3.5 becuase they have made changes so there are no gaps. There is not 5 boards accross.